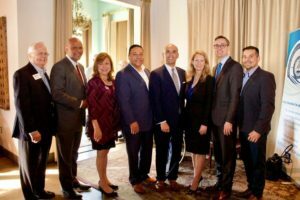 Pictured are Mike Nurre (left, GEDCC Chairman), Albert Black, Regina Montoya, Jason Villalba, Miguel Solis, Lynn McBee, Scott Griggs and Rene Barrera (GEDCC Board Member). Three area Chambers of Commerce hosted a Meet & Greet Event for the Dallas Mayoral candidates on April 9 at Times Ten Cellars in Lakewood. The tri-chamber event was a collaboration between the Greater East Dallas Chamber of Commerce, the Lake Highlands Chamber of Commerce and the Southeast Dallas Hispanic Chamber of Commerce. Six of the eight candidates were in attendance. This members-only event allowed guests to informally meet each candidate. Later, each was given two minutes to introduce themselves and outline key issues on which they will campaign. GEDCC Chairman Mike Nurre reminded the attendees of the dates for the election: Early Voting is April 22-30, the General Election is May 4, and the Run-Off Election is June 8. The Greater East Dallas Chamber will host their Annual Mayoral Luncheon, which will most likely be a forum of the mayoral run-off candidates on May 21 at 11:30 a.m. at the Lakewood Country Club. Tickets are $35 for chamber members and $40 for guests. Visit greatereastdallaschamber.com or call 214-328-4100 for more information.